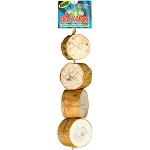 A high impact bullet proof material for longer lasting parrot toys! These are constructed from the same material used in the manufacturing of bullet proof glass! All screws are recessed for your birds safety. No bird should be without one!Large: 6" L x 4-1/2" Diameter, overall length 13"
First of all it's too big for my bird I ordered a medium bell they sent a large one .second its huge and doesn't even sound like an actual bell very disappointed with the quality and build STORE NOTE: There is no "medium" bell - customer received an invitation to review the item that she purchased, which is clearly described as a Large bell that is encased in bullet-proof plastic, so the sounds should be expected to be muffled. Awesome! and priced right. 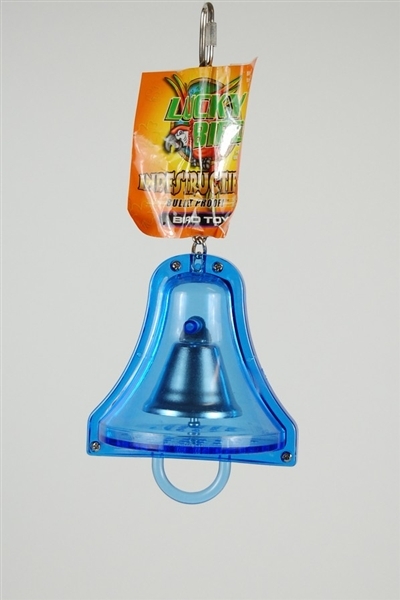 My camelot macaw loves this thing and he cannot get to the bell inside to destroy it. We go through lots of bells! So far the bell is living up to its name. My bird loves to play with it. In the eeek that we have had it, he has not stopped playing with it. My Umbrella Cockatoo loves his new bell. And it's still in brand new condition, which is amazing!